Carr Properties has announced the signing of two new retail leases at Midtown Center located at 1100 15th Street NW, Washington, DC 20005. These commitments total 14,000 square feet and will bring the building to 89% leased. Nicholas Stefanelli, owner of Masseria, will occupy 12,000 square feet with a full-service restaurant specializing in Greek cuisine, and West Coast coffee culture brand Blue Bottle Coffee is set to occupy 2,000 square feet. Midtown Center is a newly developed mixed-use project located in the heart of downtown Washington, DC. The building features two office towers separated by an extraordinary European-style public plaza, together with 44,000 square feet of tremendous street retail space. 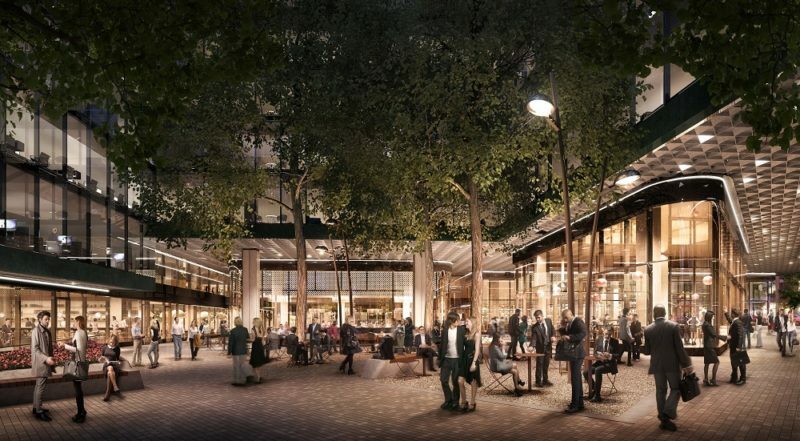 The plaza and retail space will serve as a gathering place for shoppers, tenants and pedestrians alike. Home to Fannie Mae’s new national headquarters, this new development boasts stunning bridges that create suspended connections between the East and West office towers. Amenities of Midtown Center are consistent with the building’s first-class LEED Gold design and include three levels of below-grade parking; 5,000 SF fitness center; 1,300 SF bike room; a state-of-the-art rooftop conference center with stunning views of downtown Washington D.C.; and 44,000 square feet of retail. The first phase of Midtown Center is now complete and construction of the final phase is slated for completion in June of 2018. Approximately 70,000 square feet of office space remains available together with 30,000 square feet of retail space. Dan Dooley and Kaitlyn Rausse of Carr Properties are leasing the office space at Midtown Center, and John Asadoorian, of Asadoorian Retail Solutions, is representing Carr Properties on the leasing of the retail space at Midtown Center. Carr Properties is a privately held real estate investment trust which maintains ownership of 15 commercial office properties totaling approximately four million square feet, as well as five major development projects, in Washington, DC, and the close-in urban sub-markets of Maryland and Virginia. Upon completion of its development pipeline, these projects will add an additional 2.4 million square feet of trophy-quality office space to the company’s portfolio.